Surveillance video from a convenience store shows police in Fontana, Calif., cornering and fatally shooting a legally blind and mentally ill man they say was armed with a rock and a knife. According to the Los Angeles Times, the recording of the Nov. 22, 2015, incident was made public by attorneys for the man’s family and is the latest in a number of videos that add to the debate of whether police are too quick to use lethal force. As the Times notes, this case also highlights the need for officers to be properly trained in alternate ways of handling people with mental-health issues. A Los Angeles Police Department study released last year showed that more than one-third of the people shot by the department in 2015 had demonstrated signs of mental illness. 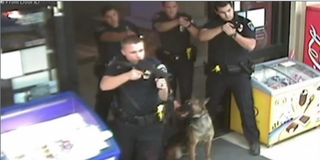 The Times had several independent experts on law-enforcement tactics review the Fontana video, and those experts questioned whether the officers faced an immediate threat when they opened fire. The video shows 47-year-old James Hall being cornered by several police officers in the back of a Chevron gas station mini-mart where they engage in a brief standoff. Hall is seen shifting his weight between two counters before an officer shoots and he falls to the floor. The initial account by the Fontana Police Department described Hall as being armed with a knife and advancing on officers before police shot him, but the video appears to contradict that story. Lawyers for Hall’s family filed a state civil rights and wrongful death lawsuit against the city of Fontana and its Police Department, the Times reports, and the lawsuit also names 12 individual Fontana police officers involved in the shooting. “It’s a disturbing video indictment of the officers,” Mark Geragos, the attorney whose firm is representing Hall’s relatives, said. His firm released the video Wednesday. The Fontana Police Department released a statement that said the officers responded to a reported armed robbery and alleged that Hall was armed with a knife and rock, but citing the civil litigation, officials declined to provide further details.